This last week I had the pleasure of attending the University of Washington Tacoma’s Center for Leadership and Social Responsibility Conference in Seattle. It was awesome. An overwhelming theme of this conference was that Corporate Social Responsibility (CSR) professionals need to take a more holistic approach to their work. Indeed, this “systems thinking” is the single biggest trend in CSR, which we’ve written about before on Triple Pundit. Nothing brought this point home like the keynote presentation from biologist Elisabet Sahtouris. Yes, you read that right… a biologist keynoting a corporate conference. She gave a similar talk at TEDxHamburg, and you should watch it (and read more about it here). “Nature conserves the things that work well, and is radically creative when things don’t work… it uses both competition and cooperation”. Elisabet shared how corporate capitalism is similar to Darwin’s “survival of the fittest” view of the world: A short-sighted view of ecosystems where the strongest survive. She points out, however, that any organism that kills everything around it will create its own demise. As such, nature adapted and now uses creative cooperation to survive. To quote Elisabet, “It is cheaper to feed your enemies than to kill them”. Corporations must learn from this valuable lesson. To save our planet, and themselves, companies must evolve — like nature — to be more creative in its cooperation. Kevin Hagen (Director Corporate Responsibility at Iron Mountain) shared how he works across his company’s leadership to help all business units embed sustainability thinking into their core operations. As a most recent example, Iron Mountain made a large investment to convert to green energy, proving that doing so isn’t just better for the world, but will also create long-term savings and help it earn future business. Steve Schwartz (Corporate Social Responsibility Marketing Manager at Tableau Software) demonstrated how it was creating employee engagement development opportunities for its employees with its Service Corps program — using social good experiences to help develop the skills of its employees while connecting them to enriching experiences. In the process, employees had the opportunity to see how its product was being used in the field, enabling them to take real customer feedback to their product teams to keep developing a better product. 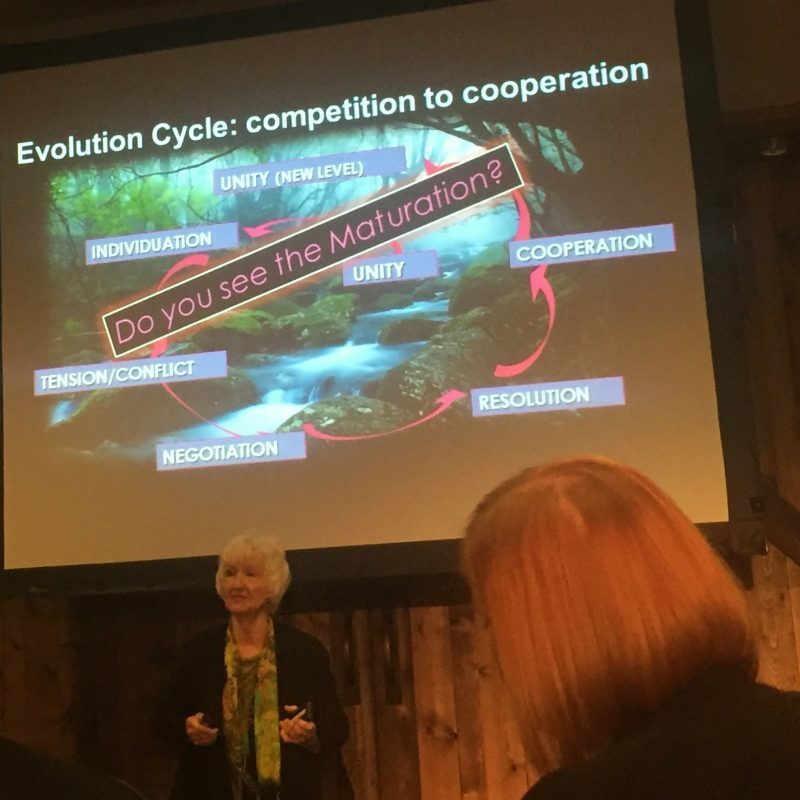 As Elisabet shared in her talk, evolution doesn’t happen overnight. However, innovation does happen faster when we take the time to learn from each other. As businesses are mainstays of our world, it’s time that they look deeply into the larger ecosystem, realize their place in it, and cooperate in a creative way that creates a healthier ecosystem for themselves, and everyone and everything else in it. So maybe business lessons from biology aren’t that far of a stretch. In fact, we’ve already been doing it for thousands of years ever since the Greeks named science “Philo Sophias”, meaning to seek guidance in human affairs by studying nature’s ways.